all," says Dr. David G. Foster, chiropractor at the Family Chiropractic Center at the Whitney Building in East Rutherford. Reflexologists share the same viewpoint. There are 7,200 nerve endings in each foot. Perhaps this is why we feel so much better when our feet undergo treatment. Nerve endings in the feet have extensive interconnections through the spinal cord and the brain with all areas of the body. Reflexology relieves and eliminates many disorders that otherwise would remain uncorrected. Reflexology continues to be an essential aid, either by itself or with other modes of therapy. Since 75% of today's diseases are attributed to stress and tension, various body systems are affected in different ways. Reflexology improves nerve and blood supply. It scopes to break up crystal deposits found in the feet, which feel like grains of salt under the thumbs. Reflexology's relaxation technique is to help balance the system. Reflexology has been known to achieve instant results for headaches, fever, sinusitis, gastrointestinal upset and menstrual cramps. A refloxologist is not a doctor; therefore, a reflexologist does not diagnose, prescribe or treat with medication, for any specific condition. A reflexologist employs methods similar to acupressure and massage to activate the crucial nerve centers that control, relax and affect the areas of the body that are stricken with pain or tension. Find out for yourself and experience the wonderful benifits of reflexology! station is set at the front of the store with her reflexology center set in the back of the shop in sterilized, yet cheery space with yellow and white paint greenery adorning tables. 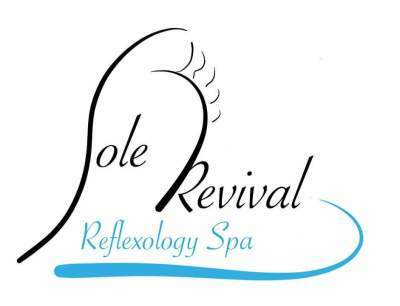 for reflexology in 1990 at the International Institue of Reflecology, specializing in the "Ingham Method." She is an advocate of natural and healthy nails and has hours of workshop and advanced proficency training. Catherine's spa-like atmosphere mixed with her soothing reflexology is something that dominates the competition.